How many letters to the Thessalonians are there? 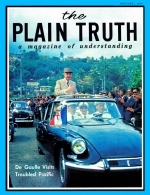 Continued, in this issue, is an eye-opening report of a 2,500 mile tour behind the Iron Curtain by editors of The PLAIN TRUTH. Here are the FACTS about the new nationalism sweeping Romania. Bucuresti, Romania; A new kind of revolution is sweeping Romania. It is a revolution from the top down. It is being led by the government and the Communist Party - not by the people against the government. It is the most important revolution to strike at the Iron Curtain since Yugoslavia's Tito defied Stalin and moved the Iron Curtain East. The Soviet Union is concerned, frustrated. But it is unable to stop it. The reason? There are no masses of Russian troops in Romania as there are in East Germany.